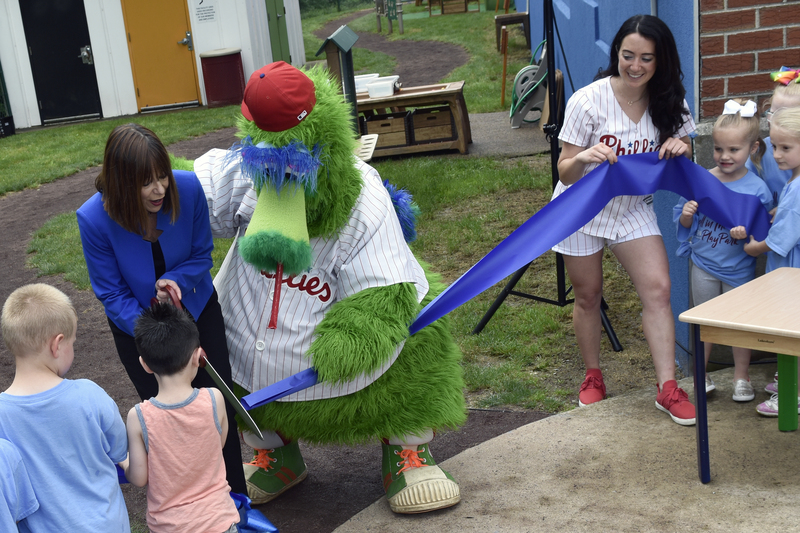 SPIN Unveils State-of-the-Art Outdoor Science Classroom with Support from Phillies Charities, Inc.
SPIN’s Discovery Yard will help preschoolers of all abilities—including those with autism and developmental delays—to develop empathy and a love for science. PHILADELPHIA (Friday, June 1, 2018) – The Phillie Phanatic and Phillies Ballgirls joined a parade of 20 preschool children with autism on Friday, in celebration of SPIN’s new Discovery Yard—an outdoor science classroom at one of the nonprofit’s early childhood centers in Northeast Philadelphia. Thanks to a $10,000 grant from Phillies Charities, Inc., The SPIN Discovery Yard was transformed from an underutilized play space into a fully equipped, interactive classroom. Cascading water and sand tables allow for large group play and exploration of science. “Mud kitchens” encourage creativity and cooperation. Large tables facilitate group lessons and activities. Natural wood materials, blocks, reading nooks and observation tools help children discover more about the world around them. Most importantly, children of all cultural and economic backgrounds, with and without autism and intellectual/developmental disabilities, will learn together in the Discovery Yard. This is central to SPIN’s vision of a safe, healthy and inclusive environment for all children, an ethos which the organization brings to all three of its high-quality, Keystone STAR 3 and 4 early childhood centers in Philadelphia: two in the Far Northeast section of the city and one in the Frankford neighborhood of the Lower Northeast. SPIN supports over 3,500 people of all ages with autism and intellectual disabilities and provides high-quality early childhood education to all children. SPIN has been named a Top Workplace for nine consecutive years by Philly.com and an Autism Center for Excellence by Community Behavioral Health. SPIN is also the inaugural winner of the Wawa Foundation Hero Award. Learn more at www.spininc.org and www.facebook.com/SPINinc.